, our voice-activated smart speaker, powered by the Google Assistant in English and French. With a simple “Ok Google”, you can get results from Google Search, turn up the music, manage your everyday tasks or even adjust your compatible smart lights. Need to solve a problem? Ask Google Home to translate phrases, do simple math calculations, or share definitions. Want some help in the kitchen? Ask to get nutritional information and unit conversions with flour-covered hands. Too busy to stay on top of the news? Ask and you shall receive the latest Canadian stories from sources such as the CBC, Radio Canada, Global News, Sportsnet, TC Media, The Weather Network / MétéoMédia and more. Your Assistant can also have fun—it can tell you jokes, play trivia or make animal sounds. Ever wanted to know what a whale sounds like? Now’s your chance to find out. Canadians are busy -- and the Assistant on Google Home is now here to help. With your permission, it will give you answers for things like your commute, your daily schedule and more. Just ask “Ok Google, tell me about my day” or say, “Hey Google, how long will it take to get to work?” and you’ll get up to speed on everything you need to know. Google Home is there to give you an assist around the house, too. All you have to do is ask and it will wake you up in the morning (or let you snooze), set a timer while you’re baking, and more. You can control your lights and switches in your home using compatible smart devices from brands like Nest, Philips, Samsung SmartThings and more. ** Just ask, and Google Home will turn off the kitchen light. 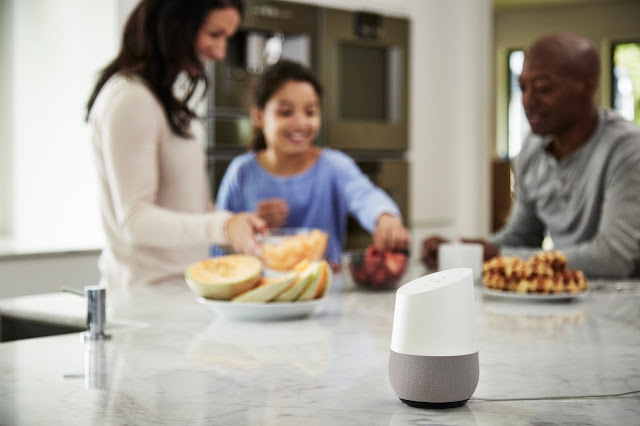 Whether you’re hosting a dinner or a solo dance party, Google Home delivers crystal-clear sound, giving you an enjoyable listening experience across all types of music. Plus, we designed Google Home to fit stylishly into any room. And you have the option to customize your Google Home with a choice of interchangeable metallic bases, available in Copper or Carbon. We know Canadians have been patiently waiting for Google Home to arrive, and we’re working to bring the Assistant to Canadians in English and, for the first time ever, in French. Your Google Home experience will get better over time, as we add more features, partners and more. And of course, we’ve hidden a few Canadian treats for you to discover along the way. Why not try asking your Assistant on Google Home about some of its favourite foods or sports teams? Google Home is available starting on June 26th from the Google Store, Bell, Best Buy, Fido, Indigo, London Drugs, Rogers, Staples, The Source, Telus, Visions, and Walmart. *Google Home is optimized for selected music services only. Subscriptions may be required and additional terms, conditions and/or charges may apply. **Controlling certain devices and features in your home requires a compatible smart device. Availability and performance of certain features and services are service, device and network-dependent and may not be available in all areas. ***Chromecast sold separately. Google Home requires a Wi-Fi network, a nearby electrical outlet, and a compatible (Android, iOS) mobile device. Minimum OS requirements are available at g.co/home/req. There’s never a dull moment at home -- from getting the family ready to go in the morning to kicking back after a long day, and everything in between. Wouldn’t it be great to get some extra help? 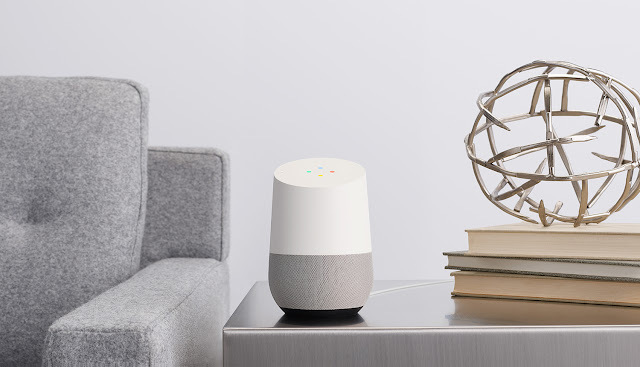 Starting today, Canadians can get their hands on Google Home, our voice-activated smart speaker, powered by the Google Assistant in English and French. A seven year collaborative effort between Indigenous communities across Canada and Google Earth Outreach has lead to Indigenous Lands being added to Google Maps and Google Earth. This marks an essential step in accurately reflecting Canada to Canadians and to the world. I’m Kanien'kehá:ka from Akwesasne (a territory that spans international and provincial borders, including Akwesasne 15, Akwesasne 59 and the St. Regis Mohawk Reservation) and I work at the Google Kitchener-Waterloo office. Since 2014, with the support of my colleagues, we have lead mapping workshops with various Indigenous communities across Canada. During that time, we’ve been asked why Indigenous Lands aren’t on Google Maps. So we set out to make that happen. On our journey, we worked with various partners, including Steven DeRoy, an Anishinaabe cartographer and director of Firelight Research Inc, to bring these reserves and settlement lands to Google platforms. As Steve puts it, “Indigenous peoples are often underrepresented on Canadian base maps, and this was made apparent during our annual Indigenous Mapping Workshops. We are thrilled to see Google recognize Indigenous peoples by integrating Indigenous lands as an important fabric of Google's base maps." Another team that worked on this project was Google Earth Outreach. The Google Earth Outreach program is proud to support Indigenous peoples using mapping technology for cultural preservation and land management. Together, we have supported Indigenous Mapping Workshops held in Victoria, Waterloo and Vancouver as well as a planned workshop in Winnipeg in October 2017. We hope to continue to build partnerships and use available technologies to better support and represent Indigenous interests in Canada and abroad. Currently, over 3000 Indigenous Lands have been added to Google Maps and Google Earth. If Indigenous communities would like to add their lands to Google Maps, or want to update information about their lands such as roads, addresses, or businesses, their government can contribute the data they are comfortable sharing via the Base Map Partner Program and individual community members can also use the Send Feedback tool to add and edit essential information on Google Maps. With the launch of recognized Indigenous Territories in Canada on Google Earth and Maps, the Google Earth Outreach program continues its work to support indigenous people using mapping technology. The goal is to enhance cultural preservation, digital awareness and land management. The hope is to use tools like Google Earth to preserve knowledge and to update Google Maps to reflect federally-recognized Canadian territories. Canada has one of the world’s most diverse populations, with more than 1.4 million people self-identifying as First Nations, Métis or Inuit (NHS, 2011) , 600 bands living on 3100 reserves and in urban centres across Canada. We are working to better reflect these stories, histories and futures within our platforms. 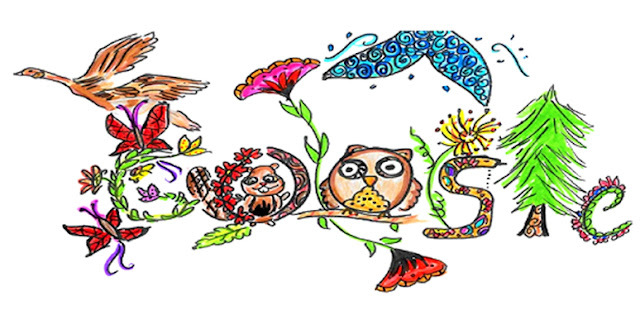 Canada’s future is bright, according to Jana Sofia Panem, Doodle 4 Google Canada 2017 winner! , more than 12,000 students from across the country submitted doodles around the theme “What I see for Canada’s future is…”. Young artists imagined a country where robots could cure disease, others dreamed of living on Mars, while some saw a world united by nature. 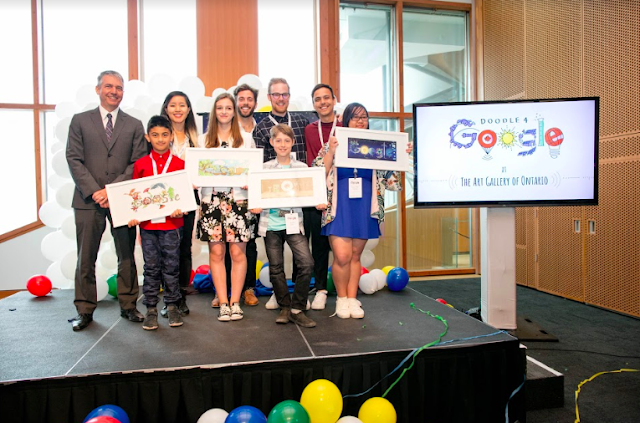 Following a very close public vote, where Canadians voted more than 400,000 times, we revealed our four incredibly talented grade group winners at the Art Gallery of Ontario. 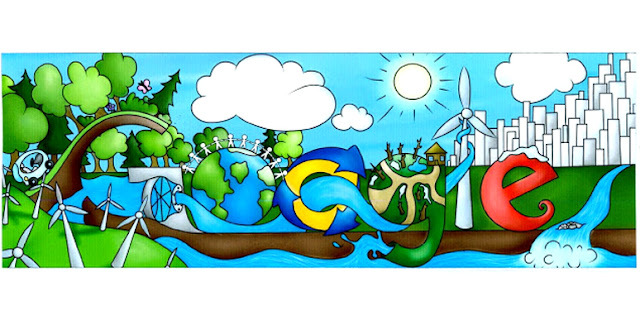 Of those four masterpieces, 11th-grader Jana Sofia Panem’s Doodle, "A Bright Future" was selected as the national winner! On June 14th, Canadians can enjoy Jana’s masterpiece on the Google.ca homepage. Google Canada is also honoured to award her with a $10,000 university scholarship and a $10,000 technology award for her school. 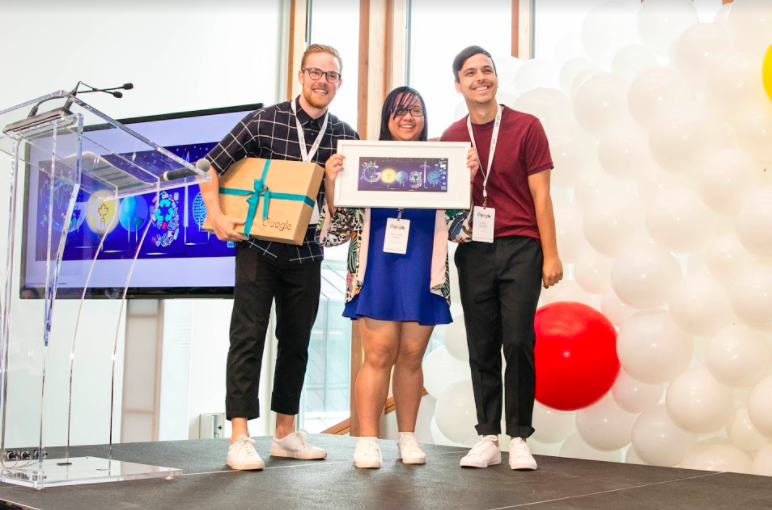 Plus, Mitchell Moffit and Gregory Brown of YouTube’s AsapSCIENCE shared a surprise award -- as part of her prize, Jana will get to join them in their studio and help draw their next video! This will be an especially lovely treat for Jana, who has a YouTube channel of her own where she shares her animations. Thank you to all those who submitted and to our finalists for sharing your creativity and imagination with us. Let’s wish our national winner, Jana Sofia Panem, another heartfelt congratulations. 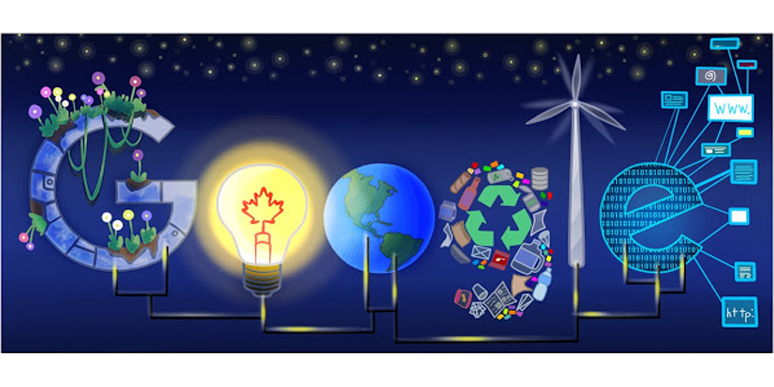 Her doodle shared a vision of our future that we're proud to share with all Canadians. In this year’s Doodle 4 Google contest, more than 12,000 students from across the country submitted doodles around the theme “What I see for Canada’s future is…”. Young artists imagined a country where robots could cure disease, others dreamed of living on Mars, while some saw a world united by nature. in the Yukon or Gulf Islands National Park Reserve in British Columbia. Or, check out Forillon National Park and Saguenay St. Lawrence Marine Park in Quebec and the world famous L’Anse aux Meadows National Historic Site and Gros Morne National Park in Newfoundland and Labrador. I’m happy that Canada, which has been demonstrating an emphatic commitment to environmental issues, will host World Environment Day 2017. As global host, it is an opportunity for Canada to further demonstrate this commitment and expand its leadership on the international stage. Each year on June 5, World Environment Day is celebrated by thousands of communities worldwide. It is the single largest celebration of our environment and there’s no better time for Canada to host than on the eve of our 150th birthday. Being the official host of this global event coupled with plans to ratify the Paris Agreement on Climate Change as soon as possible sends a clear message that Canada is fully behind global action to tackle the biggest environmental challenges of our time. Canada will use World Environment Day to showcase the beauty of its natural environment on land and water. This year’s theme is 'Connecting People to Nature’ and one of the great ways of doing this is through Street View. Take a virtual walk through Kluane National Park in the Yukon or Gulf Islands National Park Reserve in British Columbia. Or, check out Forillon National Park and Saguenay St. Lawrence Marine Park in Quebec and the world famous L’Anse aux Meadows National Historic Site and Gros Morne National Park in Newfoundland and Labrador. YouTube Pulse 2017: May we have your attention, please? The show featured a Canada 150 themed performance by Mike Tompkins, Daniela Andrade, KRNFX and the Bizzy Boom dance crew. And as more people are watching more content across more devices, one of the YouTube offers marketers is attentive reach. When people are watching YouTube, they are engaged. They’re not just watching, they are commenting, watching related videos and sharing. According to recent Ipsos eye-tracking research in the U.S., attention to paid video advertising on YouTube's mobile app is 84% higher than on TV and 1.8X higher than on other social media platforms. Sam Sebastian speaks to the capacity crowd. YouTube Pulse also gave Canadian advertisers a glimpse of our new series and specials premiering exclusively on YouTube. We’ve partnered with YouTube creators, mainstream celebrities, and world-class production companies to create seven new, ad-supported series for YouTube. Featuring global superstars like Ellen DeGeneres, Rhett & Link and Kevin Hart (just to name a few), these new shows will be available to audiences globally later this year and offer our advertisers a chance to tap into the wide audience appeal of powerhouse talent and engage viewers as only YouTube can. In fact, a recent study from Ipsos asked Canadians about the personalities that were most influential over the things they are thinking about, talking about, researching and buying. And overwhelmingly, Canadians that the personalities they watch on YouTube were more influential than mainstream personalities. YouTube is one of the most dynamic, creative and inspiring communities in history: millions of voices, creating hundreds of millions of videos, all being watched by over a billion people. Come and join the conversation! YouTube is not TV. It never will be. People don’t come to YouTube for polish, they come to YouTube for texture. They come to YouTube to see the world as it truly is, filled with people just like themselves. They come to be entertained and they come to learn.They come to witness our shared humanity. And they come back day after day. Every minute, 400 hours of content are uploaded to YouTube. And every day, people watch one billion hours of videos on YouTube. That tremendous volume is echoed here in Canada, where watchtime on YouTube has grown 30% versus last year. 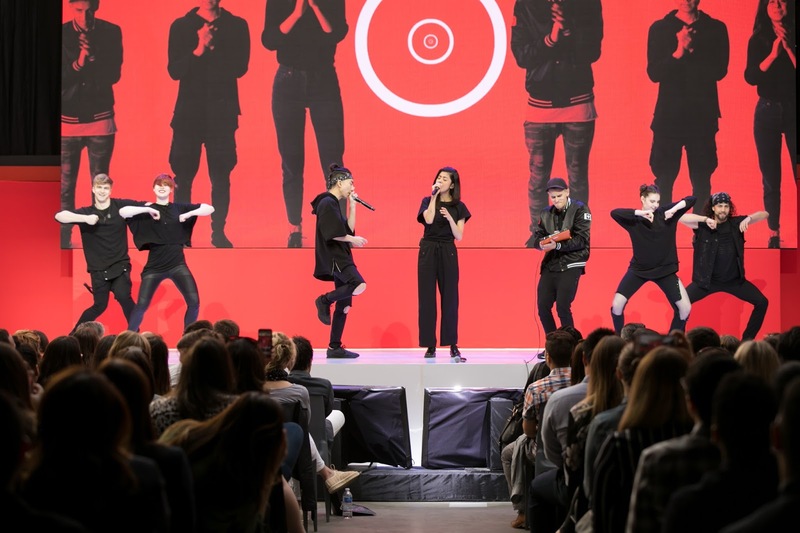 This week we hosted 700 of Canada’s top advertisers and agencies for our annual YouTube Pulse event. 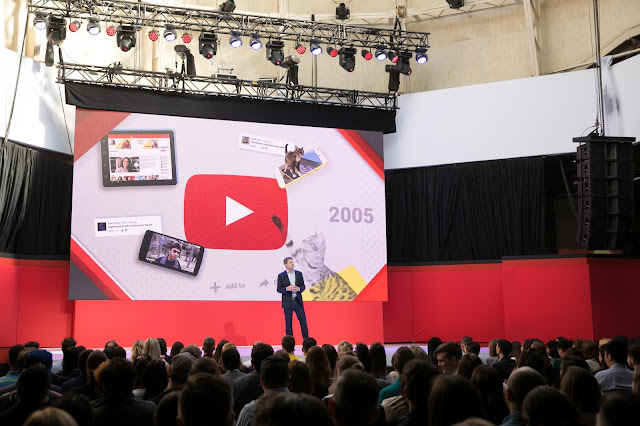 Because of the tremendous engagement of its fanbase, YouTube offers marketers something different from other mass media platforms. is coming to Canada, and with it we’re bringing the Google Assistant to Canadians in both English and French. Get help from the Google Assistant: Ask your Assistant on Google Home a question, and it will tap into everything Google has to offer —Search, Maps, Translate and more. You can get the latest on weather, traffic, finance, news, sports, and local businesses when you need them most. Enjoy your music: Whether you're in the mood to listen to a podcast or dance around the living room, Google Home helps you enjoy your favourite tunes. With a simple voice command, you can play songs, playlists, artists and albums from Google Play Music, Spotify, and more. * Plus, you can enjoy news, podcasts, and radio. Manage your everyday tasks: There’s never a shortage of things to do in the home and we could all use a little help sometimes. With your permission, the Google Assistant will help you with things like your daily schedule, commute, and more. Plus it’s a whiz at setting alarms, starting timers, and adding items to your shopping list. Control your smart home: If you have smart devices in your home, you can use your Assistant to control your lights and switches from brands including Nest, Philips Hue or Samsung SmartThings and more. A speaker designed for any room: Google Home’s high excursion speaker delivers Hi-Fi sound quality. It can also hear you reliably thanks to far-field microphones and sophisticated natural language processing. 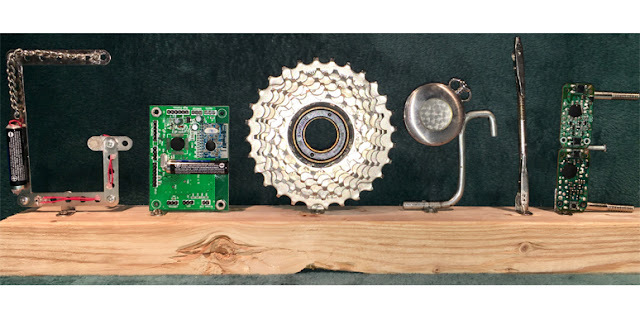 Crafted to fit naturally in many areas of your home, we designed the top to be clean with a hidden LED light ring to blend in. Google Home is available for pre-order starting today from the Google Store and Best Buy Canada. Google Home will be available starting on June 26th from the Google Store, Bell, Best Buy, Indigo, London Drugs, Rogers, Staples, The Source, Telus, Visions, and Walmart. *Google Home is optimized for selected music services only. Subscriptions/payments may be required. Google Home requires a Wi-Fi network, a nearby electrical outlet, and a compatible (Android, iOS) mobile device. Minimum OS requirements are available at g.co/home/req. Spending quality time with our family and friends at home is important. What if technology could make the most of those special moments by helping us get things done? Now, Google Home is coming to Canada, and with it we’re bringing the Google Assistant to Canadians in both English and French.